FA Cup Finals back to 1920 and post-war semi finals; post war England internationals; Amateur Cup Finals, FA Charity Shield, European Champions Finals; European Cup Finals and semi finals; European Cup Winners Cup Finals and semi finals; UEFA/Fairs Cup Finals and semi finals; European Super Cup, FA Trophy Finals, FA Vase Finals; League Cup Finals and semi finals; Scottish Cup Finals and semi finals; Scottish League Cup Finals and semi finals; World Club Championship and World Cup Finals. There are also bench-mark guides for ordinary League and Cup matches, and Scotland, Wales and Ireland Internationals. The current edition is Version 10, published in January 2013. A new version is not planned for at least another year. UK purchasers may pay by 5 x unused first class postage stamps. There are hundreds of thousands (if not millions) of different football programmes and it would be impossible to produce a definitive catalogue of accurate valuations. 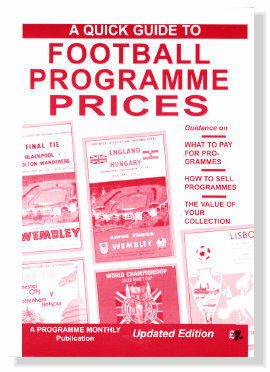 A QUICK GUIDE TO FOOTBALL PROGRAMME PRICES provides some guidance through the maze of prices in a concise 36 page booklet.